The Mohawks of Akwesasne presented the Tsi:karístisere/Dundee Land Claim to the Government of Canada in 1981 under the Specific Claims Policy. The claim was first accepted for negotiation in 1988. A revised claim was presented in 1998 and accepted for negotiation in 2002. In April 2015, the Government of Canada made a global settlement offer of $239,808,436 for a full and final settlement of the claim. The offer was based on a careful consideration of the facts, evidence, and arguments of the Mohawk Council of Akwesasne and the Government of Canada. Following the settlement offer, the parties have continued negotiations on the terms and conditions of a Final Settlement Agreement. In addition to the compensation that will be paid by the Government of Canada, the Mohawks of Akwesasne will have the opportunity to expand their reserve lands by adding up to 18,282 acres of land under Canada’s Additions to Reserve (ATR) policy. The lands will be acquired by the Mohawks of Akwesasne from willing sellers in Quebec and Ontario. Instructions for Online Voting can be obtained by contacting the Chief Referendum Officer or visiting the following website www.akwesasne.ca/referendum. The referendum on the Tsikaristisere/Dundee Claim Settlement Agreement will close on Saturday, December 8, 2018 at 5:00 p.m. EST. The results from the Online Voting period will be read on December 8, 2018 at 7:00 p.m. EST and counting of the ballots cast at the Referendum Polling Stations will commence at the St. Regis Recreation Centre. After counting has concluded the unofficial results of the referendum will be released by the Chief Referendum Officer to local media outlets and will be posted on the Mohawk Council of Akwesasne’s website and Facebook page. 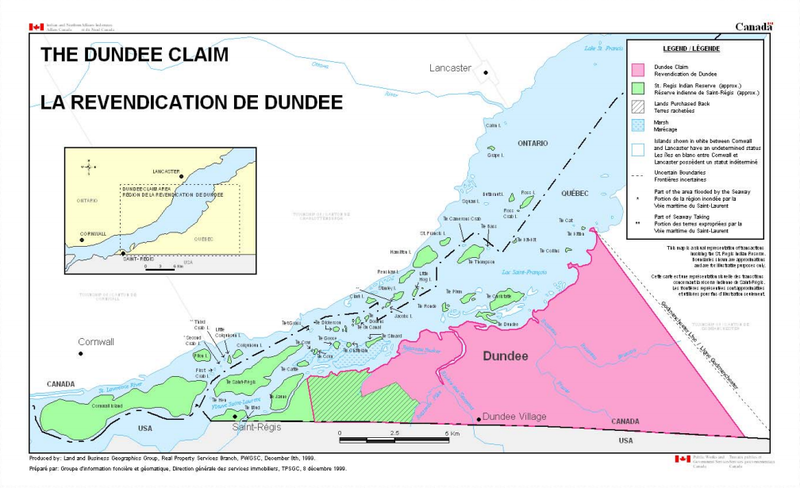 For more information for the referendum on the Tsi:karístisere/Dundee Claim Settlement Agreement or for a copy of the Tsi:karístisere/Dundee Claim Settlement Agreement or referendum regulation, please contact the Chief Referendum Officer Leona Benedict by telephone at 613-575-2250 ext. 2406, by facsimile at 613-575-1726 or by email at leona.benedict@akwesasne.ca.